Download "Supporting Active Database Learning and Training through Interactive Multimedia"
1 Supporting Active Database Learning and Training through Interactive Multimedia Claus Pahl Ronan Barrett Claire Kenny ABSTRACT The learning objectives of a database course include aspects from conceptual and theoretical knowledge to practical development and implementation skills. 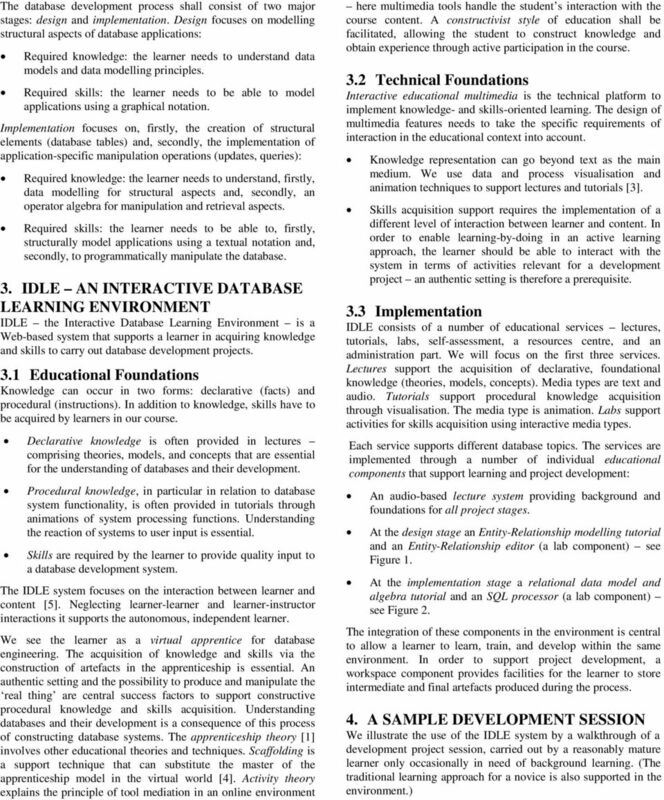 We present an interactive educational multimedia system based on the virtual apprenticeship model for the knowledge- and skills-oriented Web-based education of database course students. Combining knowledge learning and skills training in an integrated environment is a central aspect of our system. We show that tool-mediated independent learning and training in an authentic setting is an alternative to traditional classroom-based approaches. Categories and Subject Descriptors K.3.1 [Computers and Education]: Computer Uses in Education Computer-assisted instruction (CAI). General Terms Management, Design, Human Factors, Languages. Keywords Database courseware, virtual apprenticeship theory, multimedia, tool-mediated independent learning, knowledge and skills. 1. MOTIVATION The central objective of a database course is often to enable a learner to successfully carry out a substantial database development project. Database development is an activity that requires the understanding of central concepts and theories, but also the acquisition of skills. This is a property that the database subject shares with other engineering subjects. Classical learning has to be complemented with training activities. Modelling and programming activities central in database development are best supported in a learning environment through a learning-bydoing approach. We present a courseware system IDLE (the Interactive Database Learning Environment) that we have used for several years to support a database module in an undergraduate computing degree at our university. Providing a learner with the necessary knowledge, skills, and experience is usually difficult to achieve. It becomes a challenge if online media are to be used as the central teaching and learning infrastructure. Our solution to this problem is based on a pedagogic model called the virtual apprenticeship approach . In an apprenticeship the apprentice learns under the guidance of a master to become self-reliant in the subject and to master given tasks, such as a database project, on her/his own . In the virtual world the master is replaced by a tutor tool that mediates between learner and content and that supports the independent learner in becoming self-reliant. An authentic setting for the activities is central for the success . The technical side of our solution provides a Web-based multimedia system that focuses on the integration of different interactions and the mediation between learner and content. Knowledge and skills require different educational approaches and, consequently, different media and media interactions. Our hypothesis is that virtual active learning and training in an authentic setting is possible for skills-oriented subjects. Our evaluations show that an educational multimedia system supporting the autonomous learner can result in a high quality learning experience. Different media can support different aspects of the learning process. The Web offers new ways for the learner to interact with educational media. Of particular importance for the effectiveness of the approach are form and level of student interactions with educational media (which provide access to knowledge and skills-oriented activities). 2. DATABASE DEVELOPMENT Database development requires an understanding of central database technology concepts but also skills in modelling and programming. A central teaching goal of our database course is to enable learners to master a database development project. For this presentation we introduce a simplified development process which we use to discuss the requirements for a supporting educational multimedia system and our solution to the problem. 3 (5 'LDJUDP (GLWRU PRGHOOLQJ FRQFHSWV GHFODUDWLYH NQRZOHGJH 7UDQVIRUPDWLRQ 7RRO >QRW VKRZQ PRGHOOLQJ RSHUDWLRQV SURFHGXUDO NQRZOHGJH :RUNVSDFH 6HUYHU )HHGEDFN 7RRO Figure 1. Modelling lab (diagram editor applet) with access to workspace server. The simplified process model for a development project involves two stages see Section 2. The first is the design stage and has the production of a structural model using an Entity-Relationship diagram as the objective. The second is the implementation stage and has the production of two artefacts as the objective. Firstly, a structural database implementation (stored tables) shall be defined, and, secondly, manipulation operations (stored updates and queries) shall be implemented. 4.1 Design Stage Assuming that the learner the virtual apprentice in our model has already acquired some data modelling knowledge and skills, he/she can use the Entity-Relationship (ER) editor straightaway to create an ER diagram (see Figure 1), supported by the graphical features of the tool, which guide her/him to create a syntactically correct and sensible model, and to transform the diagram into a relational data model representation (SQL) and store this SQL representation in a workspace area provided by an underlying database server. The integration with other features is achieved via a workspace server. Other learning material is still available. 4.2 Implementation Stage Two aspects need to be addressed at this stage: structural definitions and manipulation operations. Structural definitions (database table definitions) are already done if the ER model was complete and has been transformed using the ER-transformation tool. Manipulation operations comprise SQL updates and queries (Figure 2). Here we assume that the learner lacks knowledge and skills to perform the required project tasks. He/she would do the relational algebra tutorials to understand how a database management system executes queries understanding the system side, i.e. how the system reacts to user input, is an essential learning objective. He/she would then use the SQL interface to write and execute (i.e. define and test) SQL queries. This practical part starts with a guided tour through some simple problems. The SQL processor interface contains two areas. The execution part representing the training aspect allows the learner to execute project-related queries. The scaffolding part representing the master provides advice, feedback, and context links. Advice and feedback are central scaffolding features for toolmediated learner-content interaction. An advice section captures, in textual form, learning problems that the instructors of this course have encountered over the years. Feedback is provided for student input. We distinguish several levels. Firstly, syntactical errors in the learner input are captured and explained in detail. The system also looks at semantical problems. For features where the solution is known to the system, the feedback tool analyses the input and gives hints or partial solutions in order to allow the learner to solve a problem. The tool also tracks the user activities and can, on request, suggest a collection of targeted exercises to overcome a particular problem. IDLE is designed as an independent learning tool where a virtual master (advice and feedback) replaces the instructor. This type of support is necessary to guide and support the learner in reflection processes. The overall objective of the apprenticeship model is to support learning and training in an authentic setting, i.e. to combine learning features (lectures and tutorials) with features of a realistic database development environment (lab components). It aims at allowing the learner to train, but also to learn about concepts and theories through active participation in authentic features. The system allows the learner to become self-reliant and take ownership in the learning process. 5. EVALUATION The effectiveness and success of the virtual apprenticeship approach and the IDLE system depends on a number of criteria: a positive learning experience for the learner, an improved learner performance benefiting both learner and instructor, and costeffective instructional design for the instructor. We address these criteria addressing opinion, performance, and behaviour, respectively, in the following sections. 5.1 Student Opinion Student attitude and opinion are important evaluation aspects. We addressed the acceptance of the approach in general and asked the students to compare the virtual apprenticeship with traditional classroom-based learning. Behaviour analysis for Web-mediated active learning 1 Claus Pahl Dublin City University School of Computing Dublin 9 Ireland Email: Claus.Pahl@dcu.ie Phone: ++353 +1 700 5620 Fax: ++353 +1700 5442 Abstract. 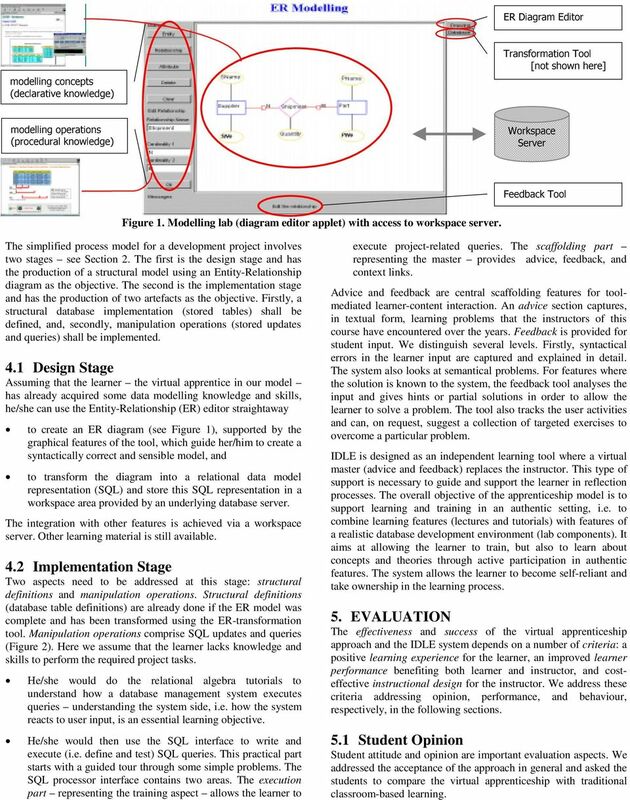 Automated Eclectic Instructional Design: Design factors Chien-Sing Lee 1 and Hwee-Reei Chong 2 Faculty of Information Technology Multimedia University Jalan Multimedia, 63100 Cyberjaya, Selangor. Malaysia. SHAPE YOUR NATION S FUTURE ONLINE COURSES IN COMPUTER INFORMATION SYSTEMS FOR INDIGENOUS PEOPLE IN COLLABORATION WITH: EARN A MCGILL EDUCATION IN COMPUTER INFORMATION SYSTEMS FROM THE COMFORT OF YOUR COMMUNITY.